Col. Lance Varney, right, assumed command of U.S. Army Garrison Bavaria July 5. The ceremony and passing of the command’s colors was presided over by Michael Formica, left, the region director of IMCOM-Europe. GRAFENWOEHR, Germany — Col. Lance Varney assumed command of U.S. Army Garrison Bavaria here at a ceremony July 5. Col. Bill Rieper had been serving as the acting garrison commander since Col. Mark Colbrook relinquished command of the garrison last month. 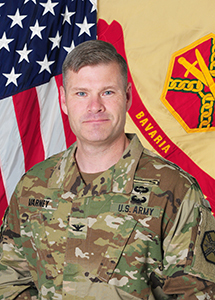 Col. Lance Varney, Garrison Commander of U.S. Army Garrison Bavaria. 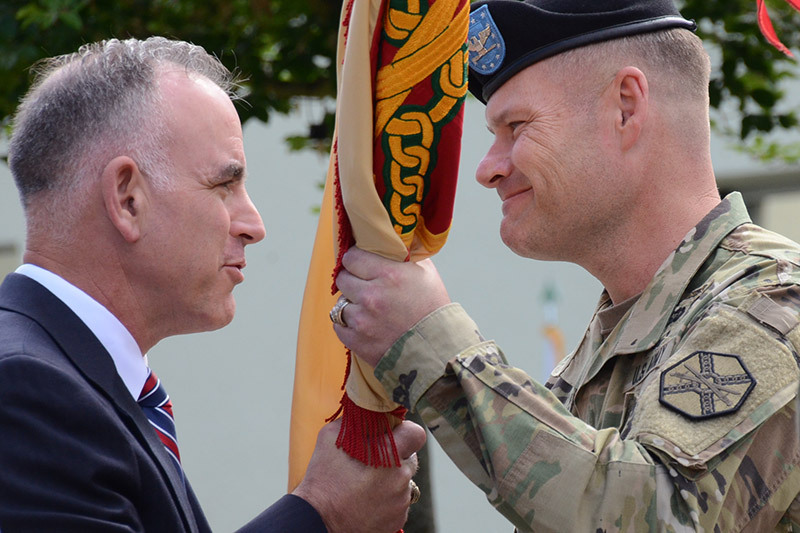 The ceremony and passing of the command’s colors was presided over by Michael Formica, region director, U.S. Army Installation Management Command Europe. Col. Varney is a native of San Diego, California, and was enlisted prior to receiving his commission as an infantry officer. He is a graduate of the Infantry Officer Basic Course, the Armor Advanced Course, Airborne School, Air Assault School and the U.S. Army Command and General Staff College. As garrison commander, Col. Varney oversees USAG Bavaria Army installations in Grafenwoehr, Vilseck, Hohenfels and Garmisch. Formica spoke of the complex and unique features of USAG Bavaria, from the importance of training here to the relationships built with partners and NATO Allies. “Besides continuing this legacy of hard military training, USAG Bavaria has also become a power projection platform,” Formica said.